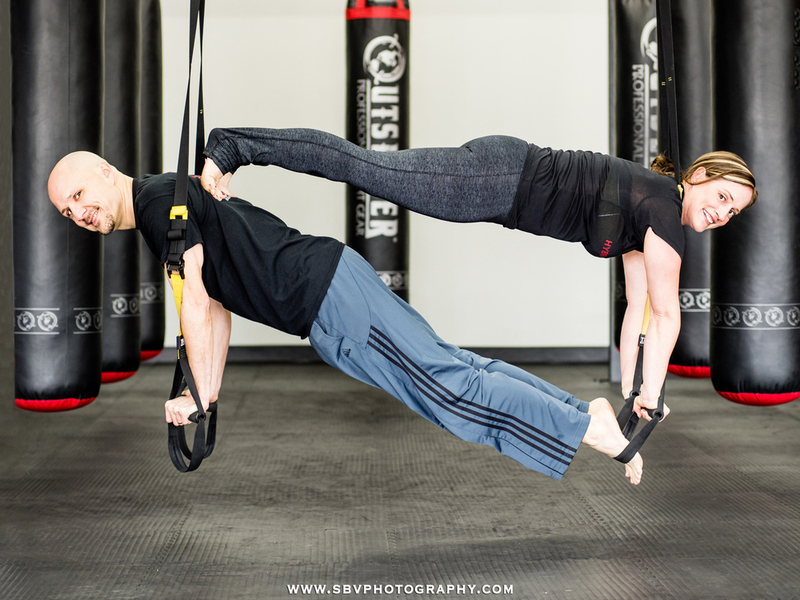 A couple works out at Hybrid Athletics in Portage, Indiana during a magazine photo shoot. I recently shot a lifestyle session with Aaron and Danielle for a feature article that is to appear in Vision magazine from Saba, the national health products company. They have been using and distributing Saba products since 2011 and are very excited to be featured for a cover story in the national publication. We began the day with outdoor photographs at Deep River County Park for a true to life glimpse at winter in the Midwest. It was quite cold and at one point I could not feel the shutter to take the picture. However, we are tough Hoosiers and we got some nice images that might possibly adorn the cover. We warmed up by moving the shoot over to Hybrid Athletics Fitness in Portage, Indiana. The atmosphere there was upbeat and welcoming. The couple showed me their favorite yoga and workout moves while I captured images for inclusion in the feature article. The fight bags at Hybrid Athletics. To propel your business or creative venture to another level, having professional photographs to showcase is essential. The Creative Professionals Package is perfect for small business owners, entertainers and more. To learn more about Aaron and Danielle's adventures in health and fitness, visit them at their Saba site right here. You can follow SBV Photography on social media below. The March cover of Vision Magazine.